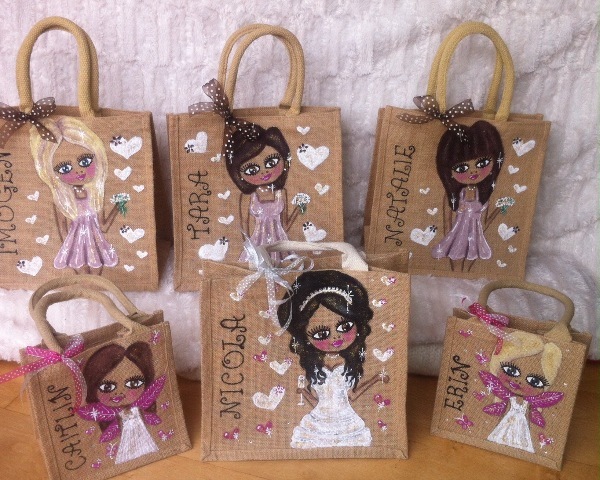 I hand paint unique personalised Jute Bags and have done lots for weddings. Bride / bridesmaids / Flower-Girl / Mother of the Bride etc. I can copy dresses & outfits to match, lots of glitter and rhinestones added. A quote can also be added to the back of the bag of your choice. I have over 10k likes on fb. Please check it out, one email to me and i can take care of all the gifts for the bridesmaids etc.